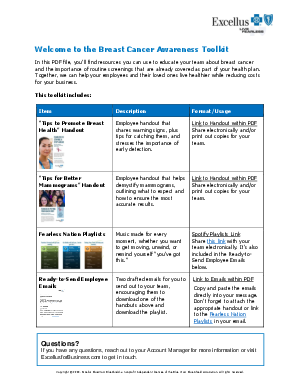 > Excellus BlueCross BlueShield > Help your employees stay a step ahead of breast cancer with this awareness toolkit. The American Cancer Society estimates that the cost of treating breast cancer will rise to $20.5 billion by 2020. Together, we can help lower these costs by educating your employees and encouraging them to take their health into their own hands. This toolkit covers everything from warning signs and the importance of early detection to what you can expect during a mammogram. Plus, ready-to-send emails make it easier for you to arm your people with the knowledge and confidence they need to protect themselves and their loved ones against breast cancer. You can download the toolkit and check out more helpful resources across a range of topics at ExcellusforBusiness.com.